Expires in 1wk . Last validated 1mo ago . Used 89 times. Leng-Leng As of 10/31/18, I tested this promo code and verified that it works as described.Exclusions apply. Yenyen As of 03/04/18, I tested this promo code and verified that it works as described. Exclusions apply. 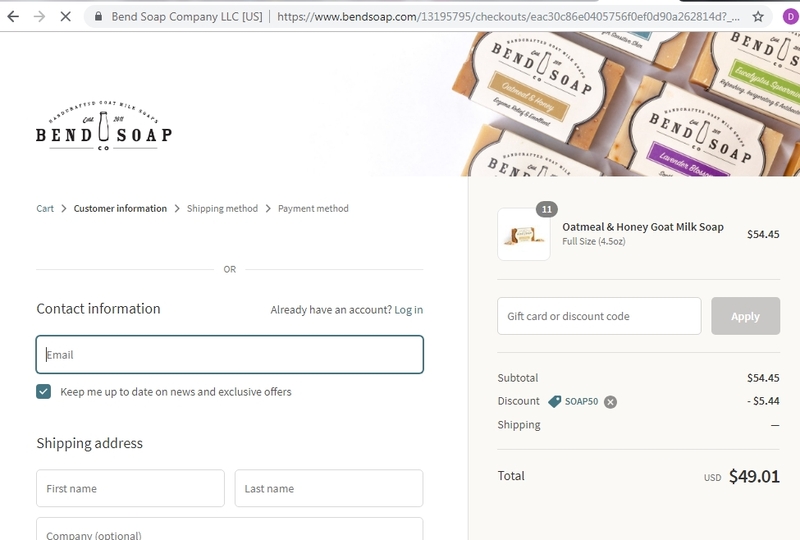 helen smart Save 10% Off on Orders Over $50 at Bend Soap Company. The product has a good offer price, you just have to look for it, get it now and get the discount. MIRIAN SALAZAR Save 10% Off on Orders Over $50 at Bend Soap Company. Just enter this code at checkout to apply the discount. There may be some exclusions that will apply to this deal.